When, in 1964, a members of a Trinidadian steel band were invited to take part in a street festival in Notting Hill, none of them realised that they were going to give birth to Europe’s greatest street carnival. There had been racial tension in the late 1950’s, and the Black people who had come over from the West Indies to work in London found it hard to mix with Londoners. As a way of breaking the ice, the idea of a street festival was suggested; street festivals being popular events on the Caribbean islands, the original organisers suggested that the sight and sound of a Trinidadian steel band playing on the streets of Notting Hill would encourage local residents, both black and white, to come out on the street and enjoy themselves for an afternoon. The first festival was an immediate success; once the black people of Notting Hill heard the music of the steel band, they came out into the street to dance and enjoy themselves as they might have done back home in the West Indies; attracted by the unusual and rhythmic sound of the steel band, others too came along to share in the experience. In short, the first festival was such a big success that the organisers decided to organise another one the following year. Since then, the Notting Hill Carnival has evolved into a huge multi-cultural arts festival, attended by up to two million people; besides being the annual high point of London’s Afro-Caribbean community, it now attracts hundreds of thousands of people from all over Britain and other countries, and has become the world’s second biggest carnival, second only to Rio. Over the years, the carnival has grown in variety, reflecting the multi-coloured and cosmopolitan nature of modern London; recent carnivals have seen the participation of groups from Afghanistan, Kurdistan, Bangladesh, Bulgaria, Russia, and many other countries, as well as musicians and dancers from other parts of Britain. In addition to the procession of exotic costumes and steel bands, there are now almost fifty static stages with bands playing different types of West Indian music, but also jazz, soul, and other popular varieties. With so many people in attendance during the two days of the festival - the last Sunday and Monday in August - moments of tension and the occasional scuffles with the police are inevitable; yet in spite of the crowds, serious problems are rare. The vast majority of those who come to this festival come to have a good time, to finish off the Summer holiday period with a day or two of exoticism and colour; they do not come looking for trouble. In Trinidad during the days of slavery, black slaves were forbidden to play musical instruments and wear costumes except on the occasion of the traditional imported European carnival, that took place six weeks before Easter. Slaves were also forbidden to be on the streets after dark, unless they were accompanying their master. When slavery was abolished in British colonies in 1833, slaves took to the streets in song and dance; to celebrate their new-found freedom, they dressed up in fancy and colourful clothes and powdered their faces white, to mimic their former masters and show that they could be masters too. 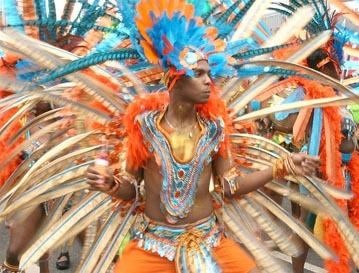 In the years that followed, as slavery eventually disappeared from other parts of the new World, carnivals developed into great moments of celebration for the former slaves throughout a large part of the region; from Rio to New Orleans, by way of the Caribbean, people vied with each other to produce the most exotic and exciting carnival costumes. Even in 19th century Trinidad, it was amazing what some people managed to produce using the very limited resources available to them. Today the situation is quite different; and although many Carnival costumes are now made up from left-overs and snippets, others are carefully made from material bought specially for the purpose. Yet regardless of how the costumes are made, the result is spectacular; a flamboyant display of colour and originality that has earned itself a highly deserved place as the most important annual street festival in Britain. steel band: percussion band with home made instruments - enjoy themselves: amuse themselves, have fun - West Indies: Caribbean islands - attended by: visited by - static stage: fixed platform - in attendance: present - scuffle: struggle, small fight - fancy: fantastic, fantasy - vie: compete - left overs: surplus and unused material - snippets: small pieces cut from a big piece (to snip = to cut) - purpose: reason . arrive - lots of - very loud - costumes - he told me that - shouting - police - five minutes - good time - next year. Updated from an article originally published in Spectrum magazine in 2000.